Commercials often portray an average person succumbing to impulses with little thought of consequence. Beverage companies run ads about obeying our thirst. 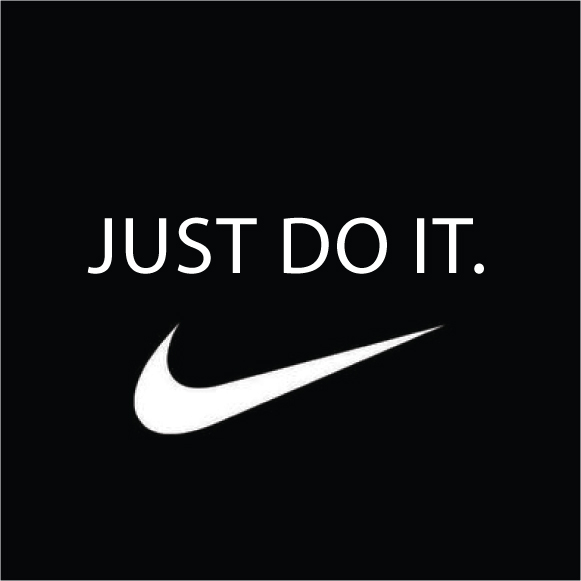 These commercials say something about us like; “we would rather JUST DO IT!”. We are well coached in the economy of compulsion than the discipline of delayed gratification, which seems so old school and out of style.” We claim moderation and self-control are good values but often times we have little will power to walk away from goods that beg for our attention. The way we deal with temptation shapes our identities. Jesus’ wilderness temptation experience follows Jesus’ baptism, where the Spirit of God descended and words of affirmation rang in his ear: “This is my son in whom I am well pleased!” Jesus is beginning his public ministry and this scene tells the careful reader Jesus is inseparable from God’s Spirit. It also reminds us this same Spirit descends on us at our baptism; establishing our union with the eternal God. Jesus enters the wilderness dripping wet from his baptism to put his baptized identity to test. The text says, “Jesus was led up by the Spirit into the wilderness to be tempted by the devil.” It is hard identifying with Jesus in the wilderness. We think of Jesus as more holy than human; unaffected by tempting things. We like Jesus welcoming the children, not fasting in the wilderness. The text says he enters the desert to face tests, which persons have dealt with throughout all of time. The devil is not on a shoulder, tempting; and God on the other, whispering comebacks. Jesus goes with the Spirit to the desert. God’s Spirit doesn’t go with him because he is divine. God’s Spirit goes because Jesus has made room for God within his baptized self. God’s spirit thrust him to face these crises, so to form and inform his identity. The reason for this identity crisis is other potential Messiahs had come and gone. Upstart saviors had gained popular support only to be squashed by the Romans. 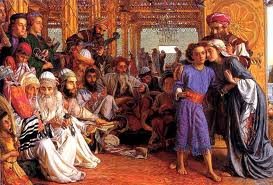 Jewish boys dreamed of the Messiah as they played games. Women told stories about a coming Messiah. Men talked among themselves of this Messiah. In this climate, Jesus entered into the wilderness to realize his own baptized identity as “the one who has come”. The tempter poses three perplexing temptations regarding his identity. The first temptation test Jesus’ trust of God’s provision. Will Jesus break his fast, turn his attention away from God for instant gratification. The tempter says, “Since you are the Son of God, command these stones to become loaves of bread.” Jesus is asked to follow his cravings rather than follow God. Jesus could turn water into wine and feed 5000, but he will not choose the quick fix; he will obediently waits on God’s provision. The second temptation test Jesus trust in God’s faithfulness. Will Jesus grandstand on God’s behalf as the divine Son and prove God’s power? The tempter says, “Since you are the Son of God, throw yourself down from the top of the temple, for you know the angels will catch you.” Jesus is asked to display divine muscle rather than to wait upon God’s faithfulness in the wisdom of time. Jesus was present at creation, but he will not cheapen the music of creation by playing God like a violin. 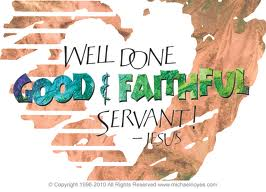 Jesus trust God’s to faithfully do what God intends. The third temptation test Jesus’ trust in God timing. Willis for Jesus to accept the offer to allow other forces make him king of the world? 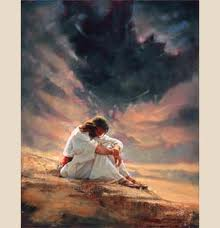 The tempter shows Jesus all the kingdoms of the world and says, “All of it can be yours RIGHT NOW just worship me.” Jesus is asked to compromise his loyalty and worship the one who holds the world to claim now the kingdoms of the world that already belong to him. Jesus is being offered a shortcut; no sacrifice, no pain, no cross, no problem. Jesus will trust God knows what to do with a life freely offered for the sake of others. Jesus knew his identity; he was the Son of God. This isn’t about Jesus seeing what he can do with his newfound identity; realizing he can magically fling books across the room. Jesus knows who he is, and so does the tempter. In fact, the evil one’s first words were “If you are the Son of God” should be translated “since”. The identity question for Jesus was what kind of Son of God would he be? All have to discern how we will live out our baptismal calling. The implementation is the hardest part. 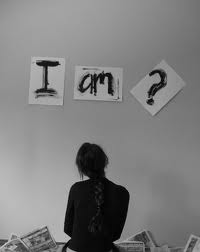 Identity crises bring us to those forks in the road that can shape who we are. Some people face crises through self-preservation because they are not comfortable in their own skin. If a person does not have the courage to be who God made, they slip into the shadows of their mind; thinking they are nobody special. Nothing stunts growth like feeling unworthy. Some churches don’t help by creating a culture of blame, so to maintain its power over people’s lives. The other unhealthy response is self-promotion; being too focused on a false sense of worthiness that over inflates the ego. We can customize our lives to satisfy our primary concern: ourselves. Many times the Body of Christ doesn’t help in this struggle; because we are too willing to play the people’s song-answering the cries of those wanting the music to make them feel good and the sermon to fix their problems. These opposite reactions produce the same result, an inward focus; preventing spiritual and personal growth in our baptismal journey. We become preoccupied with either self-preservation or self-promotion. This makes it easy to fall prey to creating God in our own image; rather than presenting ourselves to a loving God who’s forming us in Christ’s image. 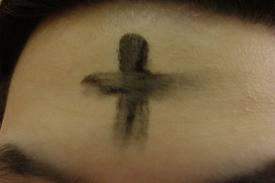 Lent began on Ash Wednesday. It falls close to New Years; tempting us to rededicate ourselves to lapsed resolutions: chocolate, lose a few pounds, red meat, or give up certain luxuries. Lent is not about giving something up. It is a forty day period of time to examine potions of our identity, like Jesus in the wilderness. It invites us to encounter Jesus’ death before we celebrate his resurrection; so to consider what needs to die and be reborn in our live. It is a season marked by repentance, forgiveness, and conversion, as we continue down the road of forming our spiritual identity. Jesus forty days in the wilderness settled his identity. He triumphed over every test; but not because he was God’s Son. We don’t let ourselves off the hook by lessening the nature of Jesus’ temptations saying God Son’s temptations were not like ours; they were not real. This provides an excuse to remain stuck in our refusals to change. What happened in the wilderness grounded Jesus’ identity. Jesus didn’t turn away, he met these tests head on; cultivating and defining his person and identity. An unexamined identity leaves us in the wilderness. Examined identities are shaped by tests in the wilderness that mold our lives in the same way they did for Jesus. Enter into a time of self examination; not to be a better person through self-improvement. Open up to self-inspection. Consider what it means to be God’s child who is under construction. Allow the Spirit to guide as us dive into the depths of our humanity; willing to turn over parts of ourselves that have yet to fully identify with what God intends in our life. This is where the identity crises begin, but it is not the place they end. Our entire life belongs to God, who wants to mold us into the image of Jesus, our example, brother, and redeemer. It is through our identity crises we are perfected in our love for God and others. I invite you into this season of Lent, by inviting you to have your baptized identity to have a crisis. The graceful hands of God can do some its best work in the midst of a crisis; shaping and forming us into the person God needs in this world. Ash Wednesday started early as the morning had not yet broken over the horizon. I stopped at Starbucks for a gallon of coffee. 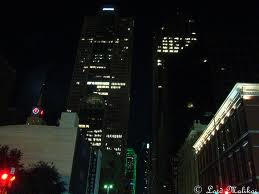 I traveled through the empty downtown streets of both Dallas and Irving; headed to First United Methodist Church of Irving to offer a ministry called “Ashes to Go”. Waiting for me, as I arrived shortly before 6:00 a.m., were Shardel Brock and her truck. It was parked outside and needed to be loaded with tables and supplies. After mixing the ashes and loading the truck, we were ready to head over to the South Irving Transit Station; a two blocks over and directly in front of the church. As we headed out the door, Paula, the church’s building attendant, asked if she could be the first to receive this mark of humility. Others begin to arrive, Cynthia Stone, Earnestine Overland, Theresa Bowers, and Debby Werle to name a few. They help complete the set-up in the dark on a sidewalk where people loaded and unloaded. We waited expectantly and somewhat nervously wondering what was next. We began by wishing a few persons good morning as they passed by our two tables. 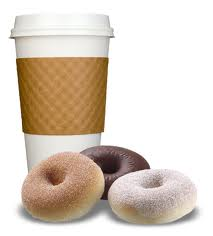 We would offer water or coffee to those within reach of our voice. Most people passed by us quickly with sometimes nothing more than a nod. Occasionally, a person would come to the tables; receive our hospitality, but a bit reluctant about the ashes. She may have not been the first, but she broke the ice when a young woman came running off the train to catch her bus to the next connection. Loudly she screamed, “I need ashes!” Ashes were applied and a blessing was spoken. 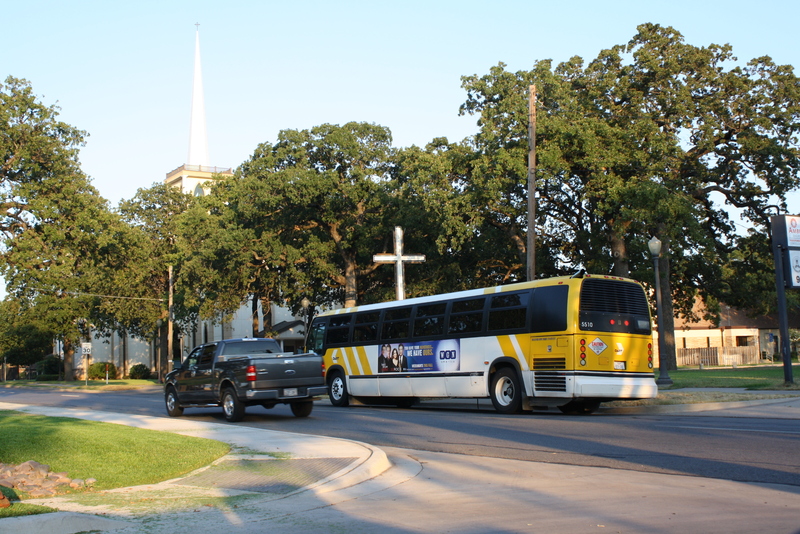 She ran to catch her bus, marked by a sign of mortality; but assured God’s grace was sufficient. “Ashes to Go” was off and running. I think the woman’s energy, energized the volunteers. Each one of them asked if I would bless them and apply the sign of the day on their forehead. The pace of the morning picked up as our freshly adorned servants became bolder in their kindness. They offered bottles of water, which had been donated by many people. These bottles were labeled with “Living Water offered by First United Methodist Church,”Irving, thanks to Gary and Bonnie Jones by providing the labels. Around 7:00 a.m., the sun began to rise. Theresa Bowers was now setting the pace; going up and down the sidewalks, offering morning refreshment to all. More people begin to gather around the table. We would share with them that today was Ash Wednesday and hand them some information about the meaning of the day. By this time of the morning, Cheryl Jennings had dropped off eight dozen donuts, which were crowd pleasers to the hungry commuters. Every few moments, a person would slide over beside me to receive the holy sign and often converse in holy conversation. My message was consistent, even to the young man whose mind was easily distracted. He asked me how to pray. I shared with him the same message I shared with all: No matter how susceptible you may feel or how difficult life may seem, the grace of God is never beyond your reach. He took with him a bible Debby Werle had provided; clutching tightly as he busily ran away. A moment of anxiety arose, about mid morning, when a man dressed in Dart uniform approached and exclaimed I was the man he was looking for! I apprehensively asked him what I could do for him. He blurted out, “Ashes! I need ashes!” He became the catalyst for the other Dart employees who began to make their way over to our table during their morning break. A few of them asked for the imposition of ashes. One man said, “I get up so early and go to be so early, I cannot go to services tonight, thank you for making this possible”. One Dart bus driver stopped his bus at the curb and made his passengers wait while I stuck my head in his bus to offer him ashes on his forehead. A volunteer handed him a cup of coffee before he drove away. As I looked around our volunteers were in constant conversations with whoever would receive our hospitality. Our base of willing servants had grown as Sue Wilson and Carol English would arrive. Persons who came by the tables surprisingly and openly shared their blessings and struggles to these lay ministers of First Methodist. Persons who were church volunteers when they awoke this morning, became trumpets of God’s love as they confidently spoke of Christ’s ability to provide what any person may need. Two persons, who were initially reluctant, would come over to the table after observing for more than twenty minutes. One of them asked for a drink and the other person desired to receive ashes. One lady drove by slowly and then backed up. She inquired from her open passenger side window if this was “Ashes to Go”. I don’t know how she knew because I don’t think she could see our signs. I stuck my head in the VW bug, put the mark of the day on her head, and blessed her as she drove away. People came by from every station in life, all of them knowing they were in need of some form of grace. The defining moment of the morning was at the end of our time at the Transit Center. Sammy had arrived to help load up the table and supplies. He and I looked around and there were three ministry conversations going on without help of clergy. We could not hear what was being said; but it was obvious tender conversations were taking place. The people of FUMC were addressing real needs of real people. These street corner ministers had all the help they needed, the faithful presence of the Spirit of God. “Ashes to Go” is more than slogan; it is way to make real the presence of the Living God among children of God who need a graceful and healing touch. In fact, it is nearly time to go back to the Transit Center for the afternoon. This sure doesn’t feel like work! I think Jesus would have told a football parable if he had lived in our times in order to convey an eternal truth about the Kingdom of God. I can see him pointing to a football game and alluding to the huddle and the play. The huddle may not be the most exciting part of the game, but it is where a team comes together for instructions how to run a successful play. Jesus called his disciples to huddle. He huddled often with the inner circle of Peter, James and John. They huddled together on the other side of the lake, up on a mountain, or in a garden, to name a few. This text of Jesus transfiguration records one of those huddles. The word transfigured is hard to translate into English. Literally it means “what he/she was”. This story is recorded in all gospels as Jesus is reaching the heights of popularity. Jesus thinks it is necessary for the inner circle to see the rest of the story. Peter, James, and John had “kairos” moment; a privileged peek into the significance of Jesus, his mission, future, and their lives too. They get to read the last page of the book. This experience changed and prepared them for the work of the coming days as Jesus made his way to Calvary. They could follow him, even as his popularity waned, while he suffered the shame of the arrest, trial, and crucifixion. The privileged peek reassured them the road of suffering would lead to greater work. It was time to get out of the huddle, so they leave that Mount of Inspiration. They walk down into the valley among the other nine disciples who were trying to unsuccessfully run a play; heal a young boy. We identify with the feelings of the valley of ineffectiveness. Jesus religious critics were giddy at their ineptness in running a holy play; some things never change. Jesus said nothing to them. He spoke to the parents, healed the boy for the sake of glorifying his Father. Don’t miss that Jesus showed up to help when it is difficult running a play after leaving the huddle. Jesus took this group to another huddle days later and they fell asleep. While they slept, Jesus received the big play. He did not immediately embrace the assignment; asking if there was another way. Ultimately, Jesus ran the play because it is the will of the Father and also so we might be able to join the huddle and run other plays in the kingdom of God. The huddle has grown day by day since that last huddle of Jesus to include those who went before us. In our huddle is the early church, who gave birth to Christ’s church after his ascension. What if they had fumbled the ball? In the huddle are believers of every flavor who flung themselves over the globe for the sake of the gospel. What if they would have grown tired in in the game? In our huddle are those who shaped First Methodist, Irving in her formative years. What if they would have taken a knee and decided not to run another play? We are in the huddle because of them and Jesus; the team on the field for this time. 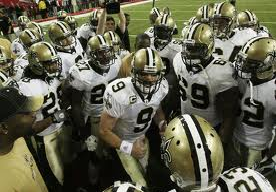 The huddle nourishes us; but our life is sustained when we leave the huddle and run a play. This is a crucial time; this last decade has been a difficult time in history of Christendom and particularly for the Western church. I shared a video of Diane Butler Bass, an American church historian, describing our religious landscape with some young adults who are forming a new class. She reminded us how at the end of the 1990’s the church was poised to do great things. Worship attendance and membership was increasing for the first time in several decades. Then the 21st century rolled around and we have experienced what she calls “the worst decade in American religious history ever”. The church along with all other institutions, (education, government, markets, etc.) have spiraled downward and lost their bearings in the last ten years. Our church is a snapshot of this reality. 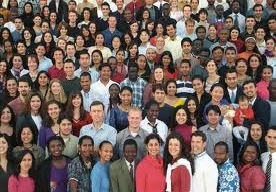 Fear based panic is expressed in huddles in churches of every size, flavor, or kind. Many different plays are being called. United Methodists are huddled up readying to run: “A Call to Action”. Catholics are running a play they call: “Come Home”. Southern Baptists called their play “The Decade of Evangelism”. Our plays feel like Hail Mary’s; acts of desperation to me. Bass has spent recent years looking beyond the institutions to find signs of hope. Signs of faith are always emerging; God does not slumber or take a day off, much less a decade. She has gone to margins to listen to longings of people on the street. She has recorded her findings where she observed people looking for God, connecting with others who have similar dreams to serve neighbor and discover themselves. Bass is not sure these longings will be met by the conventional forms of church. Yet, she doesn’t think churches are going to go away; they are just going to have to change the plays they run in order to be the church in the 21st century world. I learned this week of a new play run by a church led by Rev. Danieley, Rector, St. John’s Episcopal Church, Tower Grove near St. Louis. In 2007, she was feeling these same things and wondered what it would be like to take Ash Wednesday to the street. A coffee shop owner nearby allowed her to set up on their property. The shop owner provided a tent and coffee to people who came for ashes. 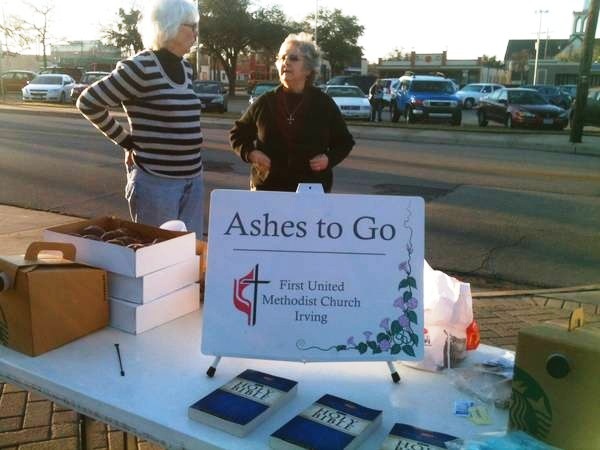 It became known as “Ashes to Go”. The movement has grown so much that in last year the Episcopal Bishop of Chicago took to the streets in full vestment along with 26 other congregations. This year forty churches are breaking the huddle in Chicago along with churches in St. Louis, San Francisco, New York and who knows where else; running the play of taking the liturgy of the church to the people on the street. 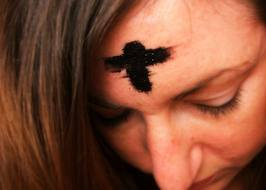 The most common reaction of those who received ashes (besides being caught off guard it was Ash Wednesday) was pleasant surprise. Most told stories of a longing to experience more church, but were not sure they would be welcome in the church. This year, I think the Methodists in Irving, Texas should run the same play. I have invited a small group of young adults that I am working with to help me prepare to run this play near the South Irving Transit Center. I will working with the staff in the morning making additional plans and the Program Council tomorrow night. I know it is last minute, but I just learned of it this last week, and there is no time like the present. Maybe this is a Hail Mary, but I think not. We were not given the gift of the church to keep for ourselves. We give it and us away like Christ who gave up his life for us, so we might have real life. This feels more like what our Lord might have done as he passed through the Galilee offering graceful touch to those who least expected it. This feels more like what Christ might have done as he passed through the Sheep’s Gate and offered a healing touch to a man who had longed to be made well for several decades. This feels more like what Jesus meant when he told his parents in the temple and Pilate at his trial: “I am about my Father’s business”. I invite you to join me in running this play. Not every person can run every play. If you feel called, here are some ways you can do so. We need signs made and materials to pass out. That means creating and printing what is needed. We need persons to be present Wednesday morning from about 6:30-9:30 a.m. and/or that afternoon from about 3:30-6:00 to help set up and perhaps move tables if we have trouble finding the right spot. (I am not sure if we will do both times or one or the other until after we do some planning tomorrow), I will also need people to assist me in administering the ashes or visiting with people who want to talk. If you want to help in these ways or others that come to your mind, write your name, email, and phone number on sheet of paper and give it to me on the way out the door. It has been good to be in this huddle on this day. I think we are ready to run a play. On three, Ready, Set in the name of the Father Son, and Holy Spirit we have gathered and we shall scatter. All God’s people say: AMEN! Diana Butler Bassis an author, speaker, and independent scholar specializing in American religion and culture. She holds a Ph.D. in religious studies from Duke University and is the author of eight books including Christianity After Religion: The End of Church and the Birth of a New Spiritual Awakening, forthcoming from HarperOne in February 2012. Her other books include A People’s History of Christianity: the Other Side of the Story (HarperOne, 2009), nominated for a Library of Virginia literary award and the best-selling Christianity for the Rest of Us (2006) which was named as one of the best religion books of the year by Publishers Weekly and was featured in a cover story in USA TODAY. This is a six minute clip that asks the question raised in the title. Click here to see. I am also going to post this to my other blog, so you will know. Stages of Faith: Vocational Grace Luke 4:14-30. I have a cousin who pursued his desire to be a history teacher on and off for years. Virgil spent most of his adult life slugging away at a job he never enjoyed or found fulfilling. When I saw Virgil this summer, he is doing something truer to which he is. He told me he has never been happy. I wonder what would have happened if he had followed his heart and felt like he lived up to his purpose in life. It is not unusual for any of us to keep doing what we are doing in our adult lives because of some kind of psycho-therapeutic reaction to our childhood. We think we will be happy if my mother or father approves what we are doing. Some ministers hear a pseudo call to ministry to get approval from their earthly father, rather than hearing the voice of their heavenly Father. This matter of vocation is one of the toughest and most important challenges in life. 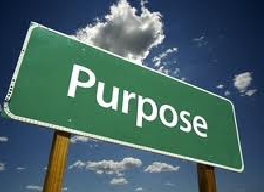 Another way to speak of this pursuit is to talk of knowing our purpose in life. Plans without purpose can leave us unfilled because we end up doing good things, but never the thing, which were made. A golf club can make a good walking stick, weed chopper, pot stirrer, and even a weapon, which we saw this week. But it until it is used to feather small white ball inside ten feet on a plush perfectly cut swath of grass it is not fulfilling its purpose. A golf club like a person is made for a purpose. 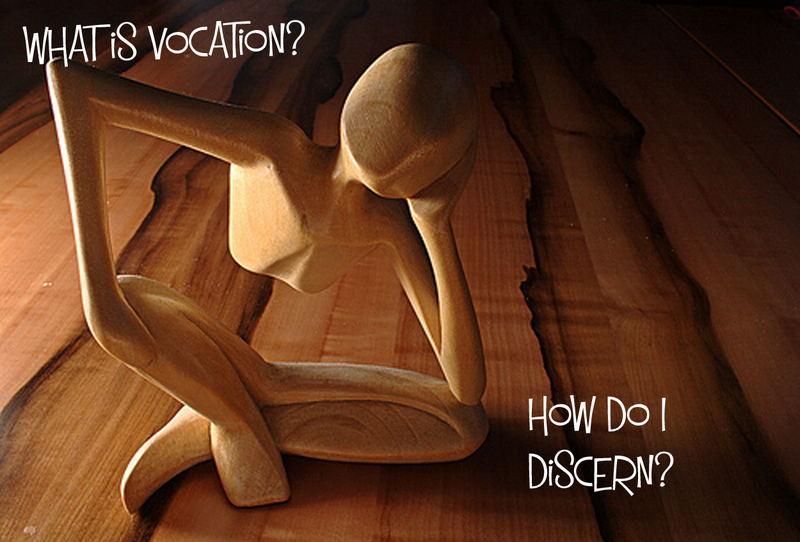 How do you find your vocation or know your purpose? We have been looking to Jesus for a pattern to follow from womb to tomb. Our assumption is Jesus was no alien from another world whose life was so foreign to ours we cannot relate. On the contrary, Jesus was the true human, the one who struggled through the passages of life like all the rest of us and he too had to find his calling. Let’s look how Jesus received vocational grace to work through this most important stage of faith. First, he stayed in the precincts of the temple; the shadow of the steeple, so to speak. Jesus was saturated with scripture and a Jewish worldview from his earliest days. Jesus could draw on Abraham, Moses, Elijah, and Jeremiah as his guides when he thought about the purpose of his life. His life among the community faith gave his life purpose in the world. In this text, we see Jesus goes to the synagogue, as usual. The president of the synagogue calls the hometown boy up after the Torah reading and asks him to read from the prophets. Jesus seems comfortable with the request. 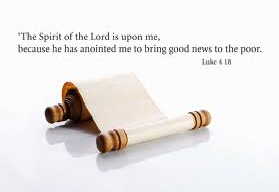 He stands, asks for the Isaiah scroll, unrolls the parchment to the 6th chapter and reads, “I have come to bring good news to the poor, release to captives, sight to the blind, freedom for the oppressed, and to declare the year of the Lord’s favor.” He then sits and tosses off a few words of commentary saying that what Isaiah once prophesied to returning exiles from Babylon is now his life purpose too. He could claim his purpose because Jesus had been shaped throughout all his life orbiting around the hometown synagogue and engaged in the annual rituals of the temple. If we are to hear the call of God and discern that voice among the many voices, we have to listen to the grammar of God and cadences of the Spirit. A level of competency is needed that exceeds being acquainted with the story of God’s salvation history in the world. That can happen to some extent on our own or among conversation partners. Nothing can replace the life of a faith community that strives to live the law of love among each other and in the world. This means being in relationship with flesh and blood that we love and annoy each other all at the same time. As we press of the flesh week after week in the church we learn about each other, which helps us know our purpose unlike anything else we can do. The practice of living among those who practice faith is where we hear, discern, and claim our purpose in the world that extends our lives beyond this world. A California Federal court ruled in August 2010 a call in show where people talked about matters of faith with a clergy person “did not give congregants opportunity to associate with each other in worship”; therefore it was not able to claim a nonprofit status. AUScourt confirms what God expects. Any association that does not include people in spiritual relationship doesn’t constitute a way to fully know God. It is within the precincts of a faith community that we are schooled, so we can best know and live our purpose out in life. All of us have a purpose in life, and we will hear and answer that call by keeping ourselves faithfully among the faithful. It may be tough to discern the particularities of our call. There is no secret to the nature of the call; God’s call is not novel. God is consistent; so there is only one call. Our call will connect with what God has been up to before we showed up on earth. God’s mission in the world has not changed. God’s purpose is the same for Isaiah, as it was for Moses, as it was for Jesus and the early church and for us too. God’s consistent work in the world is captured in these words from Jesus first sermon, “to bring good news to the poor, release to captives, sight to the blind, freedom for the oppressed, and to declare the year of the Lord’s favor.” This aptly describes in one sentence what God has been up to from the Garden to the Exodus; from a people and a land to a temple to an exile; from a reformed nation to being reborn in Christ, from a Spirit that blows into person to a church that proclaims the good news. The song is the same. While the call of God has not changed, the call of God is different for different persons. Everyone is not Moses, Isaiah, Jesus, Paul. Nether is everyone a, prophet, messiah, or apostle. Whoever we are we are citizens of the kingdom of God, which operates on the principles of bringing good news to the poor, release to captives, sight to the blind, freedom for the oppressed, and to declare the year of the Lord’s favor. Each person must ask how this agenda fits into our lives. Some might be thinking they are going to have to quit our jobs and go into the ministry. Yes, and no-yes, we are all in the ministry already, every last one of us. We are serving someone or some constituency, whether we acknowledge it or not. But no, we don’t all have to work for the church. Yet, we need is to reestablish the connection between our essential calling as children of God, which we all have in common and our particular work. We thank God for people who do that every day. 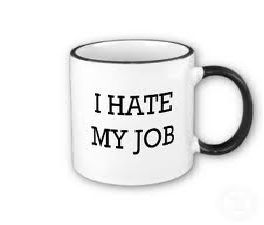 There are business owners who chose a loss in order to share the burden of a difficult year with their employees. There are lawyers who decide the interest of justice for a client is more important than billing hours. There are doctors that refuse to hide behind any limitation health care rules create in order to provide the best possible care to a patient. There are teachers who work seven days a week for low pay, so students may be prepared with both the knowledge and experience needed to engage this 21st century world. There are many ways to accomplish the agenda of extending thekingdomofGod. The all include in one form or fashion Go’s universal purpose. I believe people are well intentioned, but sometimes they get caught up in their own interests. They want to do the honorable thing, but they succumbed to pressure; thinking jobs, kids, property, or something temporal is the most important thing in the world. They befall to the temptation of self and lose their purpose of bringing good news to the poor, release to captives, sight to the blind, freedom for the oppressed, and to declare the year of the Lord’s favor. Churches can lose their way too, when they become so obsessed with building, budgets, potlucks and their own people that they set aside God’s purpose for the church. 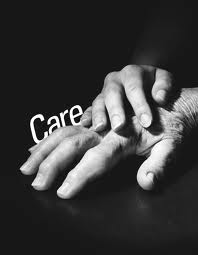 God doesn’t care whether we are an accountant, tax collector, missionary, politician, homemaker, therapist, butcher, baker or a candlestick maker. God knows we will find joy when we live into God’s purposes. Be confident God wants us to know our purpose and will work harder to clue us in than we will ever know. It is possible for one to be a writer of deodorant commercials and live into Gods purpose. It is equally possible for one to be a doctor in a leper colony and not live into God’s purpose. It all depends whether we are engaged in God’s overarching purpose. Make no mistake, this was Joseph’s fault and if you don’t believe me, ask Mary. A mother would never let this happen unless depending upon her husband. Mary and Joseph and the family have been to Jerusalem for the feast of the Passover. They are in the usual big caravan (today it would be a Dodge Caravan) to Nazareth, traveling on donkeys, maybe a (Joe) Camel or two, if anyone had money, but most of them walked. It can be real confusing; getting up before dawn to travel. My family always got on the road by 4:00 a.m., so we might make good time before rush hour and kids could sleep in the back of the car. It was probably dark outside and Mary’s is watching the little ones. She asks Joseph to look out for Jesus and the big kids. Joseph was not to worried about Jesus, he was always the responsible one; no trouble at all. Mary may have been talking with the women about the kids. Joseph is with the men; talking about the upcoming game. (Giants/Pats) Kids are playing games and racing to the top of the next hill. At sunset, they make camp. Jesus’ parents are about to experience every parent’s nightmare. As the porridge is served, Mary calls Jesus; there’s no answer. She calls for Joseph. He gives her a deer-in-the-headlights look. They race; asking the kids if they’ve seen Jesus. Every time we read this story it jumps right off the page making our hearts beat faster. (beach story) We can feel their alarm, if any of us have ever felt that wave of anxiety that rushes over us when we realize our children may be missing. I think Mary and Joseph headed straight to Jerusalem, though travel was not safe at night. I can hears them imagining what may have befallen him. They may have felt they blew it for God who had given them this special child, which angels circled around. They must have hoped the angels would come back and help. The road is uphill, really. They search everywhere and there is no sign of him. They go back to the temple to look there and perhaps pray. They find him there. After giving up hope, they find him in the place they never figured to lose him-the temple. The church seems like the right place to lose our children. Parents fight the thought of losing our children from the start. From the time our child leaves the womb, we spend energy and emotion trying not to lose them. We wean them as infants, but the whole experience of a child growing up requires constant weaning. Weaning happens when we put our child in the nursery and sit in church pretending to listen to the sermon while we plan our quick exit on the last Amen. Weaning happens on the first day of kindergarten as we wait at home or maybe in the car, half-hoping they liked it and half-hoping they cried missing mom and dad. Weaning is waiting to hear the garage door go up, the trek to the dorm room, and the walk down the wedding aisle. This morning we come to a spiritual weaning moment, the day a child is confirmed as member of Christ’s church. Like Jesus, at twelve years of age we wean our children from our sole care in the life of faith. At confirmation, they make pledges to make the faith their own. It’s a big deal! We are walking through the stages of faith. We are trying to understand the graces that guide us; looking how the stages of faith in our lives parallel Jesus’ growing up years. We’ve seen how prevenient, redeeming, and baptismal, graces are active in our lives, just as they were also active in the early life of Jesus. We acknowledge there are places where it is hard to imagine comparing our faith journey to Jesus. Yet, it is clear that though he was the Son of God, he too needed to discover of grace just like us. Jesus had to learn who he was, who his true Parent was, as we do too. Today, we look at the stage of faith where confirming grace resides. Mary and Joseph ask Jesus, “How could you do this to us?” For all their expected upset at Jesus for staying behind, they had to know this day was coming. 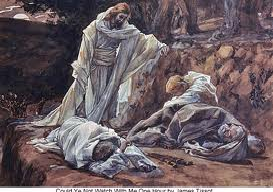 They had spent twelve years guiding Jesus’ spiritual preparation, which led to this day of losing him at the temple. On this day, they witness him symbolically being passed back to God from their spiritual watch care. 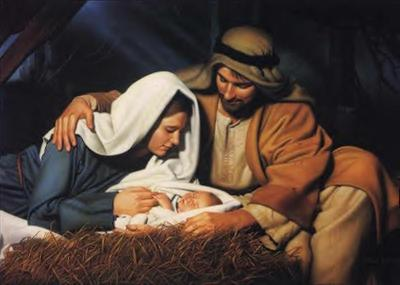 They would still be his parents and Jesus would still be their child, but from this point, things would be different between parent and child. Jesus would answer to a higher obligation; his heavenly Parent. We should not be surprised Jesus was engaged in vigorous conversation with the teachers of the law when his parents found him. Joseph and Mary had plenty to do with him being able to do so at age twelve. Yet, Jesus had to take what he learned and make the faith his own; for God has no grandchildren, only children. This scene in scripture is Jesus receiving confirming grace as he moves toward the next stage of his faith life. Citizens participate meaningful if they understand their roots, basic doctrines, and current events of their native land. Our founders knew democracy depended upon an educated electorate. This concept was a key factor behind the birth of public education. Children must be afforded the opportunity to learn about history, constitution, government, and its alternatives, otherwise we have an uneducated and apathetic electorate. The church’s business is to make disciples. 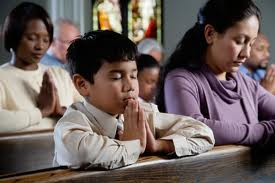 So, when parents and children ask how old they have to be to join the church; they are expressing a genuine excitement about an important rite of passage, their desire to make the faith their own. The church must enable this process if we expect them to make commitments to be a part of the body of Christ, partners in the gospel, and priests alongside us. There`s no social promotion simply because a child says they love Jesus. We are to provide occasions for our children to dig into their heritage to encounter the God who reached out to save a people from foreign taskmasters and delivered them through the wilderness. We are to create opportunities for our children to wrestle with the person of Jesus and what he taught. 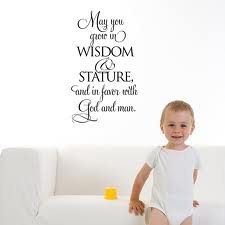 Our children are to grow in wisdom and stature till they willingly take faithful steps in service to others. They must make their own decision to make the faith their own. The process usually begins at age of twelve through confirmation. Children are in classes; covering the basics of the faith: who is the triune God, what is the role of the Bible, how do I fit into the church, and various other subjects needed in the life of faith. We are fashioning young theologians; upon completion participants confirm the promises made on their behalf at their baptism. They no longer just go along with their parents’ faith; they take personal responsibility for their faith before God and the church. At the end, we celebrate with them for making the faith their own. The process of confirmation works as long as leaders take it seriously and parents and children do not treat it like an elective. We insist our kids take their school work seriously, so they will be prepared for their world. We should be as equally adament for their soul training as we are their career training. No excuse saying; religion is a personal thing, I want my children to choose for themselves, or I don’t want them to grow up hating church. The confirmation process should prepare our children to engage both worlds faithfully. May we have equal resolve to also offer Sunday School classes that produce growth, camps that change lives, Vacation Bible Schools that shape souls, and other needed spirit stretching possibilities. In the end we want to feel a sense of parental and congregational pride as our children grow up and make the faith their own; fulfilling the promises we made at their birth and baptism. If we do our job well, we will lose our children in church, and in losing our children to the church, we lose them to God. The best part; when we find them there, we will find them growing in wisdom and stature and in favor with God and all people.